Well here’s something each and every single one of us hockey fans have been aware of all season long. Brendan Shanahan—the head disciplinarian of the National Hockey League—lacks consistency. Ever since Shanahan jumped on board and agreed to take over for Colin Campbell and his wonderful job, he has proven to the hockey world to not be any different. We all remember Colin right? The one who didn’t suspend repeat offender Raffi Torres for absolutely destroying Brent Seabrook behind the net because “anything goes behind the net,” but he later suspended Steve Downie for one game for the exact same hit. Here I am thinking anything goes behind the net. Weird right? Or of course letting Ovechkin go with quite a few blatant knee-on-knee hits before finally laying down the law with the powerful two game suspension to Ovi. Well as you can see, it was clear that we needed a change. Bettman went out and hired the All-Star Game creator Brendan Shanahan to take over this role. Remember him? He wasn’t exactly the cleanest player during his days but that’s beyond the point. Dale Hunter used to be a nut job, but his calm presence behind the bench is exactly the reason why the Capitals were able to knock out the Cup Champion Boston Bruins, and is currently giving the Rangers everything they’ve got. So Shanahan can’t really be judged based off his playing days. With one whole regular season under his belt, and currently half-way through one playoff season as well, we’ve now been given numerous reasons as to why we could, in fact, criticize Shanny for his job. Raffi Torres, the goon of the league who has no business at all throwing any kind of questionable hit was handed a harsh 25 gamer for his ridiculous hit on Hossa. I’m sure most of us won’t even question that one. Torres deserves every game. But the main reason behind the ban being that harsh? Hossa is hurt and has not played since (NHL or IIHF). Just this last week, Alex Ovechkin laid a questionable hit on Dan Girardi of the New York Rangers. Ovechkin was away from the puck (deflecting the puck off his inner skate doesn’t make him a part of the play) and jumped, leaving his feet, into Girardi, completely destroying him and knocking him down. Another instance that has been much talked about is the Weber-Zetterberg incident in the very first game of the Playoffs for both the Wings and the Predators. 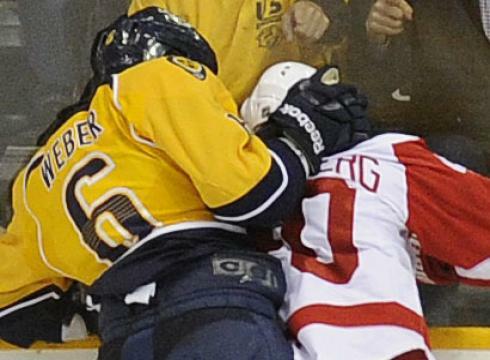 After Zetterberg hit Weber from behind, Weber replied back with a punch to the back of the head. Afterward, he grabbed Henrik's head and bashed it into the glass, cracking his helmet. A cheap shot right? Nothing to do with the game right? I mean this wasn’t even a hit that went wrong like Torres or Ovechkin. It had absolutely nothing to do with the game. Does that remind you of anything? Zetterbergs teammate, that one guy that wears #44 was banned from the NHL in 2004 for a dirty cheap shot that ended the career of Steve Moore. Once again, what’s the difference between the two hits? Moore’s career came to an end, and Zetterberg was able to brush off the hit. How in the world does that make Weber's actions legal? Just like the above example, Bertuzzi’s hit was obviously more violent, but they were both out of line. Once again—injuries seem to be the deciding factor for suspensions, according to Shanahan. But wait! Hold the phone. Shanahan doesn’t even know how to be consistently inconsistent. Lets look at his most recent ban. Claude Giroux was given a one gamer for hitting Zubrus, with the “principal point of contact, being the head.” Giroux did not leave his feet, Giroux did not lead with an elbow, and Giroux did not hit a player away from the puck. He was simply completing his check, and caught Zubrus off guard. He did however, like I stated, hit Zubrus in the head. But Zubrus had his head down, and didn’t expect it. Zubrus also was not injured on the play, and went on to score the game winner, and nailed the coffin shut with an empty-netter late in the game. The result of all this? A one game suspension. Lets rewind back to early March now. Jakub Voracek was skating up the sideboards with his head down while settling the puck on his stick. He was suddenly destroyed by a hit from Kronwall of the Detroit Red Wings. Kronwall did not leave his feet, Kronwall did not lead with an elbow, and Kronwall did not hit a player away from the puck. He simply hit a guy that was in the wrong place at the wrong time. Voracek as well did not get injured. But most importantly, the principal point of contact was the head. Which according to Shanahan, is exactly what we are trying to eliminate from the game. What’s the verdict? Clean hit. Once again Mr. Shanahan, what’s the difference between the two hits? Did Zubrus get injured, thus resulting in Giroux’s suspension? No. So why the suspension? I thought injuries warrant suspensions. So there we have it. The consistency isn’t there. But when it is, it’s almost ridiculous to see that injuries are what warrant suspensions. So pick a side Shanny. Do you want to be the guy that gives idiotic bu consistent suspensions? Or do you want to give idiotic inconsistent suspensions. Apparently those are the only two choices for you so take your pick. once again people bring up the fact that he yelled at the refs beforehand. If we're gonna use that as a rallying point for suspensions, then every player would receive a game every week.